I arrived in La Salle, IL around 1:30pm CDT, so I was doing pretty good, timewise. I stopped at the McDonald’s there to grab some food and bum their Wi-Fi to look at the RUC and other data to further refine where I needed to be. I decided that further south and west might play out better as the shear profiles and instability was higher in that direction. So, without ado I bolted down US 51 then west on IL-18 where I went through Henry, IL. 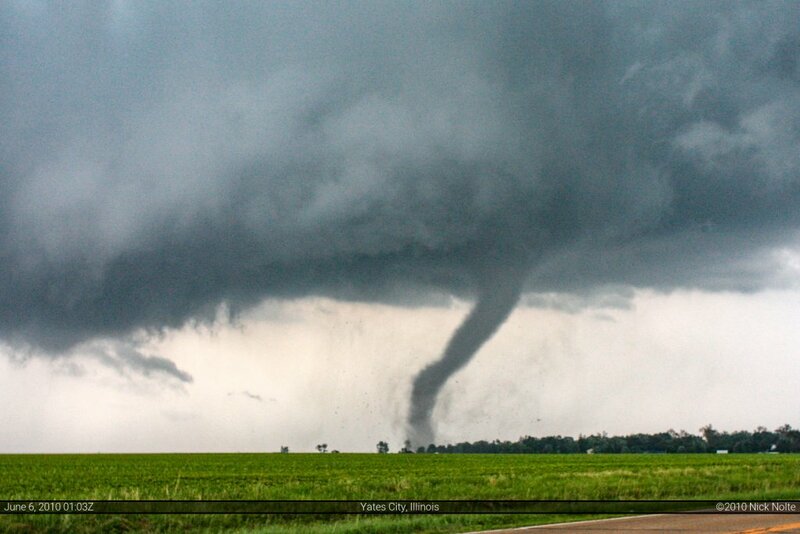 A town that would see a tornado just five hours later. After a bit of driving west and seeing piddly storms popup and die off I headed back north to I-80 to get into Iowa. Not too long after I crossed into the state, a tornado watch was issued for Iowa and Illinois. I then headed south on IA-27 out of Coralville to get to Mount Pleasant, IA which is a good place for roads to hop back across the Mississippi River if need be. I arrived in Mount Pleasant at 5:30pm CDT and I was starting to get worried about daylight. I knew there was about four hours left, but NOTHING was happening. There were little rain showers popping up, then dying off. 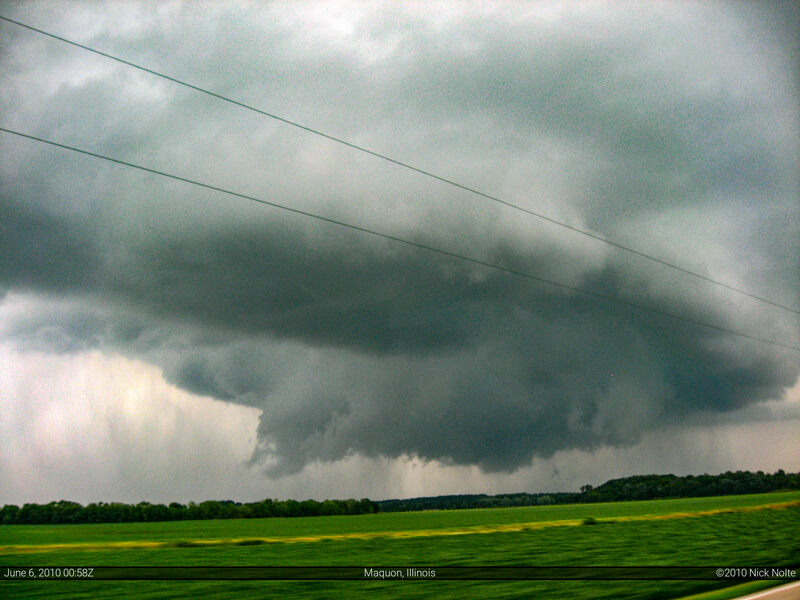 A line of storms had developed in far western Iowa and went severe warned, but it fell apart as well. So I took refuge in a Wal-Mart parking lot for about a half hour or so contemplating what to do. I started looking at observations and forecast models again and decided the wind in Iowa was already switching to unidirectional. I decided I needed to get back into Illinois where the surface winds were at least backed a little bit, and get in the area of better shear. So, it was about 6:17 when I left Mount Pleasant and headed east on US 34. It wasn’t long after that a storm popped up on radar about 20 miles down the road that would later turn out to be the supercell that dropped the Yates City tornado. As I traveled down US 34, the storm would look OK on radar, then it would appear to be dying. But around 7pm the storm seemed to be getting its act together and it was starting to look better, both on radar, and in real life. As I approached the storm a little after 7pm as I beared down on Monmouth, IL I decided to jog down US 67 to move a bit south rather than punch the core and try to get ahead of it. Plus my AT&T connection was sucky in this area, so I couldn’t watch the radar to see what it was doing for sure. I was worried the 11 mile trek down US 67 to Roseville would put me way behind the game as my plan was to head east on IL-116 then north on IL-97 and finally east on IL-8. As I turned north onto IL-97 the weather radio went off telling me the storm was tornado warned and that a tornado was confirmed. As I approached it from the south I could tell it had really gotten it’s act together. As I turned east onto IL-8 just south of Maquon and about 7 miles west of Yates City I was soon treated to the site of very picturesque mesocyclone. 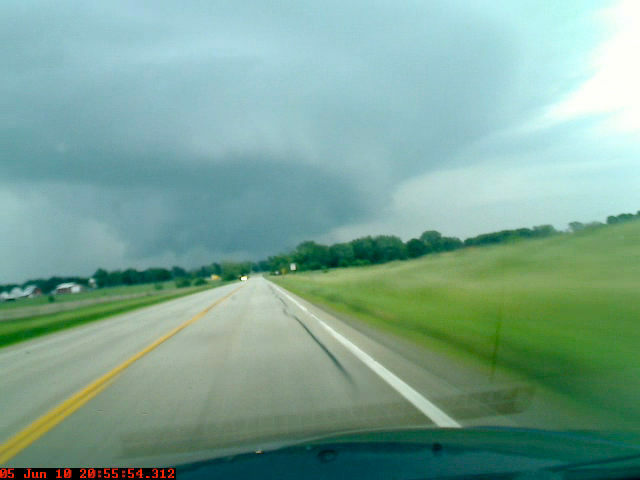 This is a screen grab from my dash cam video as I approached the storm. Not long after this screen grab I finally saw the tornado. It was one of the most picturesque I’ve seen, and it was throwing all kinds of debris around it. It wasn’t long after these photos that the storm tracked through the town of Elmwood and did some serious damage. I was unable to continue on IL-8 through Elmwood as the road was blocked by debris and emergency vehicles. 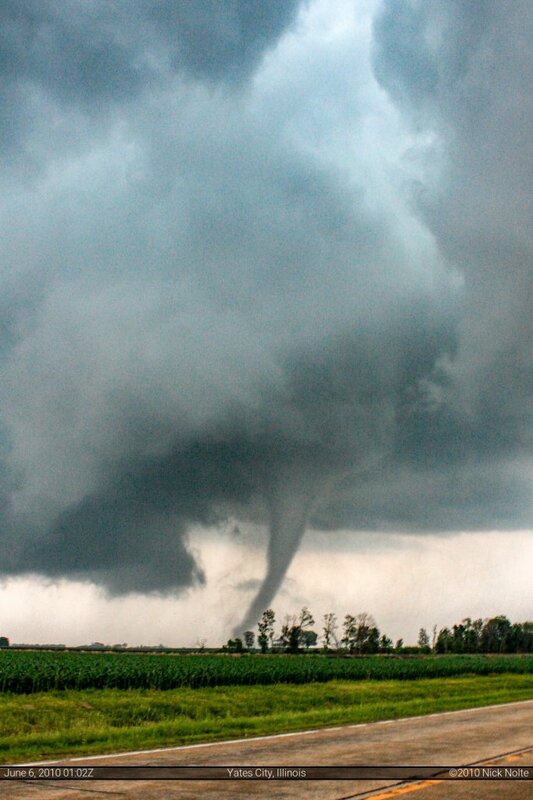 The tornado had appeared to lift shortly after it crossed the road in Elmwood, but as I diverted around the town to the south and was heading back north about two miles east of town I could see the tornado still on the ground to the east, it could have been a new one as well. 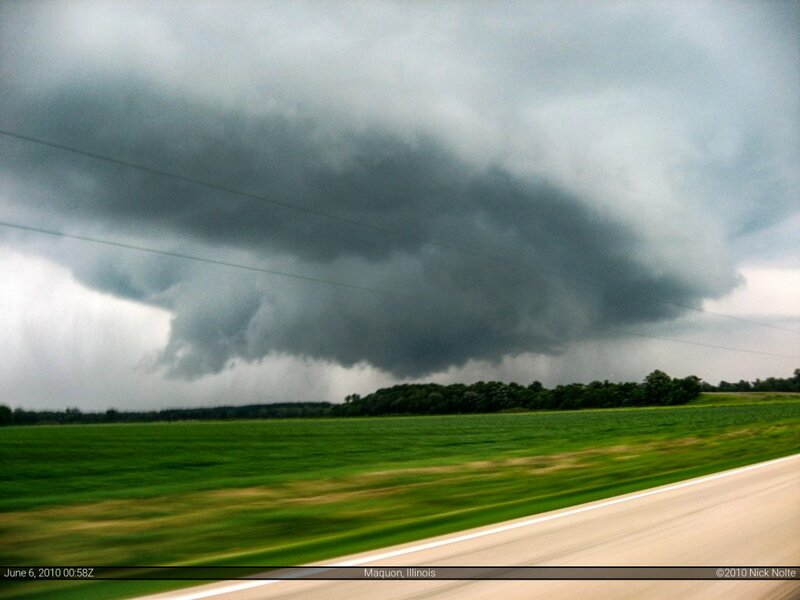 Just east of County Highway 22 on Illinois 8 I crossed the damage path of the tornado. Trees and telephone poles were twisted and snapped halfway up. I saw garage doors blown completely inward. Trees on houses, limbs and branches everywhere. 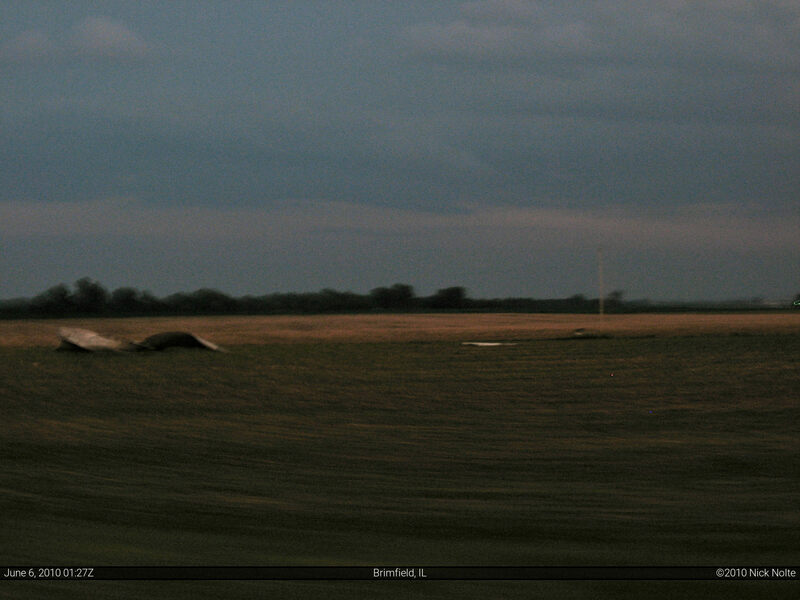 Debris in a field, what appeared to be parts of either a barn or silo, the largest of which was the size of a van. Here are some blurry pictures of the damage, as it was getting dark at the time. 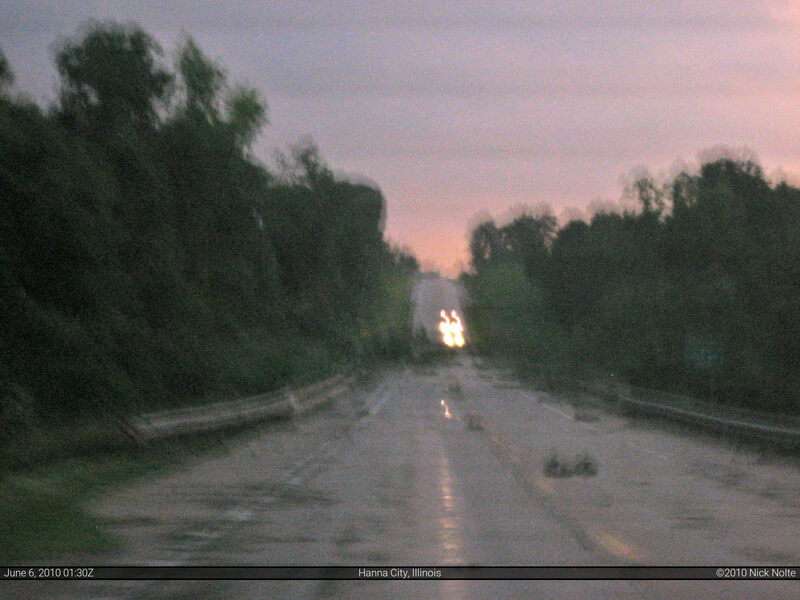 I tried to lighten them a bit, but here’s what you get  The left photo is where I believe the tornado crossed IL-8, there were trees, branches and all kinds of debris blocking the road. I had to zig-zag three times to get through it. The right photo is the debris from a barn or silo in the field I mentioned earlier. I continued after the storm, but darkness was falling and the storm was headed straight for Peoria. The National Weather Service had issued a Tornado Emergency for the city, which is something they issue when there is an extreme threat to a populated area. 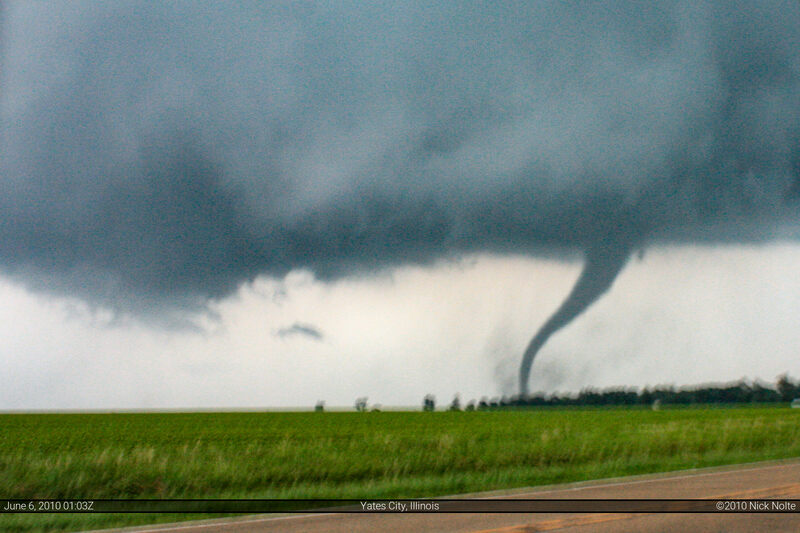 The tornado spared the city, but hit a suburb to the northeast of town. Later, as I was driving home on Interstate 55, I approached the town of Dwight. It was obvious the town had been hit as there was easily 25 to 30 emergency vehicles in the town. The exit ramps to the town were blocked off. 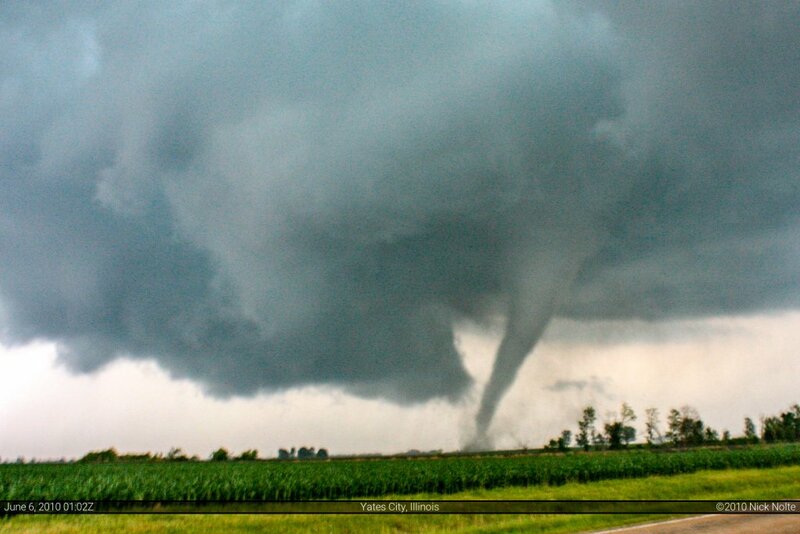 I later found out that there were two tornadoes that hit Dwight, and an extraordinary amount of damage was done. All in all, it was a successful chase day, however with a somber note as, unlike my previous three successes this year, this tornado did not stay over open fields. A little closer to home, apparently the tornado sirens went off in Jackson County six times. Southeast Michigan and Northwest Ohio also got hit especially hard. 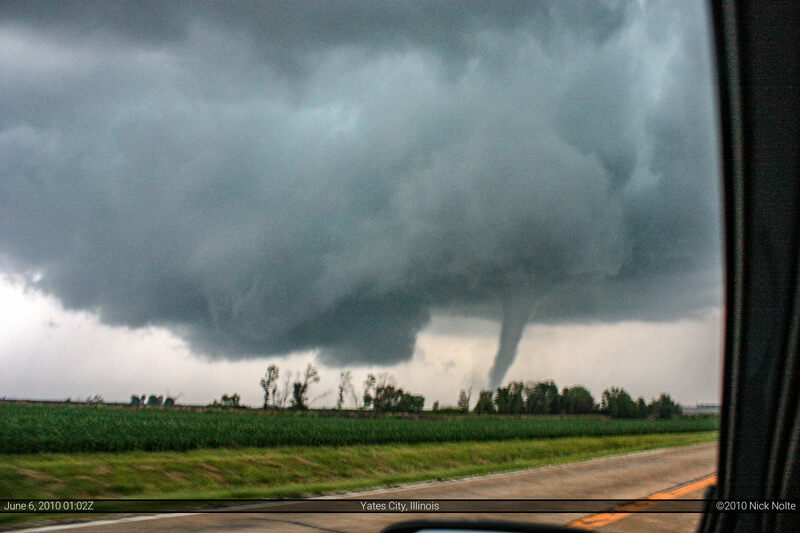 Here’s a Flickr stream of the damage from Northwest Ohio.